Available in Sheffield and Retford. A Great addition to any suit and the perfect gift for groomsmen or as a birthday gift. All our pocket Watches come with a 12" chain and most are ideal for engraving. Available in multiples subject to availability. A Silver Skeleton Dual Movement Half Hunter Pocket Watch. Including chain. See something you love? View before you buy at one of our branches. Your local family run Jewellers here in Sheffield and Retford. As well as the pampered pooches Charlie and Henry. whether it be HAND MAKING the perfect wedding ring, recycling old jewellery or handcrafting a beautiful engagement ring for the one you love. Handmade at the workshop here in Sheffield. A 2 Carat cushion Sapphire set with two pear shape 0.25ct diamonds either side. 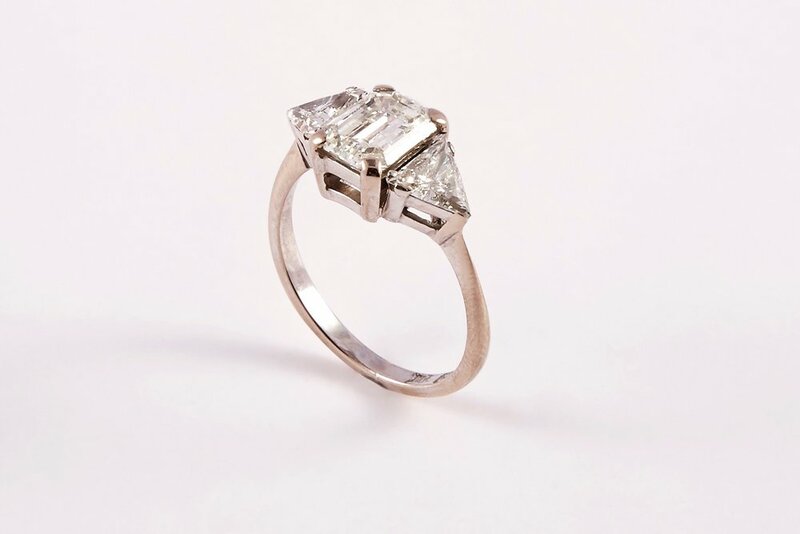 A Platinum Emerald cut Engagement ring set with two trillion cut diamonds either side. 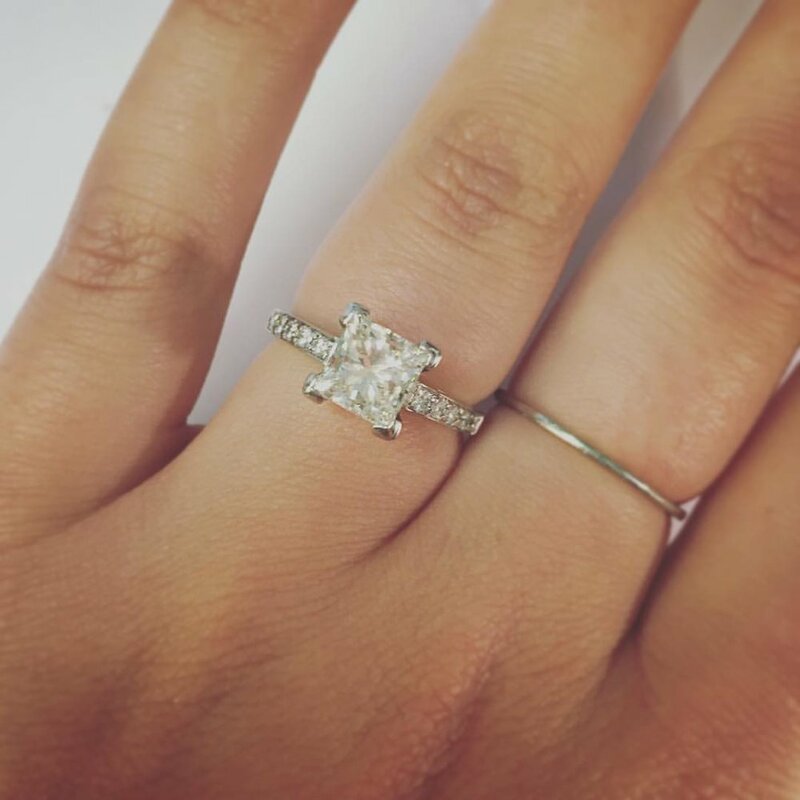 2.50 Carat tw. 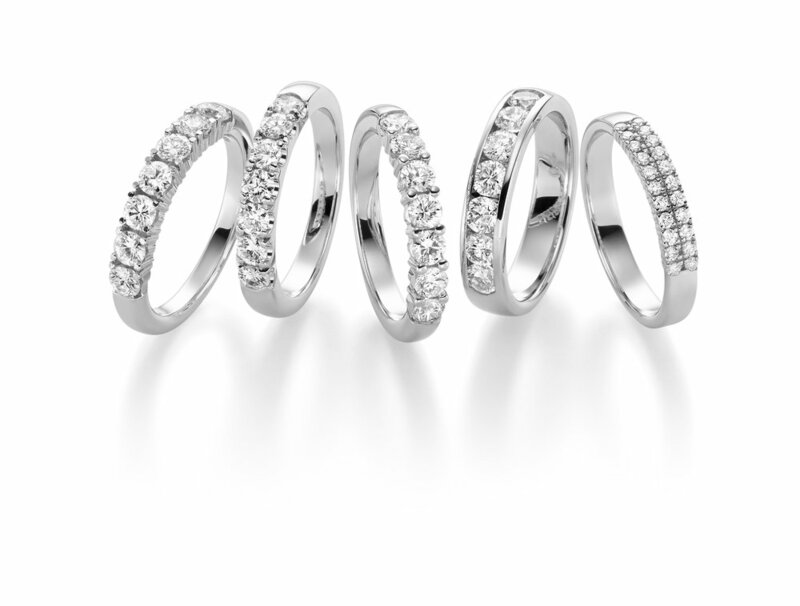 We like to think of ourselves as wedding ring specialists here at Hallmark Goldsmiths, David our Jeweller here in Sheffield has been making wedding rings for 30+ years. We now boast a large collection of plain, diamond set, titanium, patterned and fitted wedding rings for you to try in store, which are all fully customisable to suit your style and budget, at our on-site workshop in Sheffield. 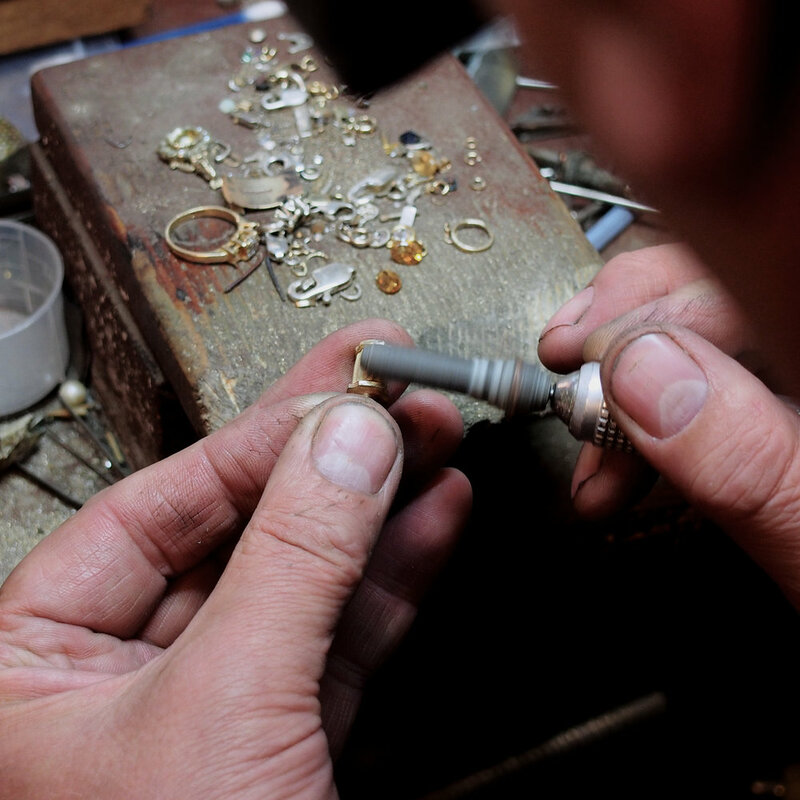 Give old broken jewellery a new lease of life, with our restoration service. All completed on-site by our own MasterCraftsman, pop in for a free estimate. Inherited your grandparents old wedding rings? Getting married yourself? Why not remodel your family heirloom to suit your own style/needs. Come and chat to our in house mastercraftsman to discuss your requirements. Most of our watch repairs are undertaken on-site in Sheffield with watch batteries and strap replacements completed while you wait. Watch services for all makes and models including, Rolex, Omega, Breitling etc. done by our watch specialist. David mastered his trade at the height of the Silversmithing industry in the 1970's. His love for Silverware is seen by his extensive collection in store. He loves to give a new lease of life to old silverware. Estimates are free in store. Full Servicing and Repairs, undertaken by our specialist clock repairer. Once your repair is complete your clock will be delivered straight to your home and set up accordingly. Estimates are free. Pearl Necklace Restringing and restoration. Take advantage of our pearl stringing service, whether your looking for a new string of pearls or you want your grandma's pearls bringing back to life. Includes the restoration of vintage pearl clasps. All Stringing is done on-site in the workshop. Follow us on social media to be the first to know about news and offers.